Having to work outside in the cold can be a pain, as cold hands can be become painful and stiff, slowing the pace of your job and hurting productivity. The Kinco Lined Pigskin Thermal Gloves with Safety Cuff 1938 are designed to keep your hands warm in the cold, allowing for fast work and full dexterity. 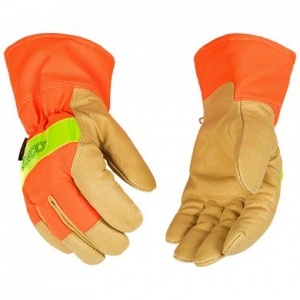 With 3M Scorchlite Reflective Material for visibility and a safety cuff to protect against abrasions, these gloves provide excellent safety and protection as you work. Standard glove cuffs may work to keep debris out, but won't provide the protection needed for those tough jobs. 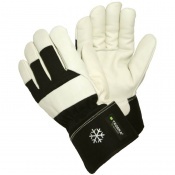 The safety cuff on these gloves is made with rubberised material, providing excellent protection from abrasion that adds to the overall safety of this glove. Working in low light conditions can make jobs dangerous, so it's important to ensure you can be seen at all times by passing traffic. 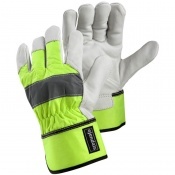 These gloves are made with 3M Scorchlite Reflective Material, ensuring you'll be fully visible to anyone in your vicinity. Many leather work gloves are made with sub-par leather that can stiffen, crack and become useless after multiple wears. The grain pigskin used on the palms of these gloves will stand up to plenty of abuse, staying tough, pliable and soft to the touch for as long as you need it to. It will retain all its qualities after drying, and also features great abrasion resistance and durability.